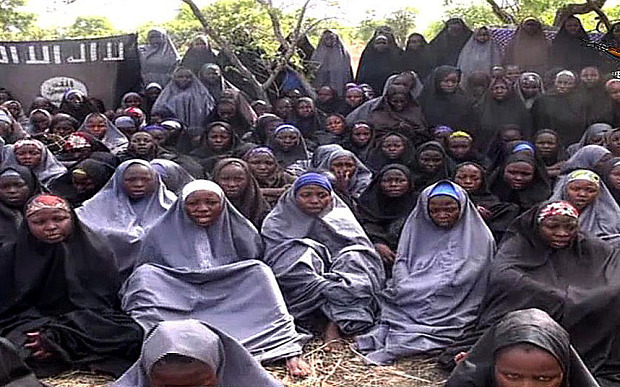 Boko haram terrorists today released a new video showing girls believed to be Chibok schoolgirls. “This is a message from the Jama.atu ahlis sunnah lidda awati wal jihad under the leadership of Abu Muhammad Ibn Muhammad Abubakar As- Shekau. We are sending a special message to the parents of the Chibok Girls and the Nigerian Government. Masked armed man standing in front of girls ( Speaking). We thank God for giving us the opportunity to send this message to the parents of these girls (Pointing at the girls sitting behind him). I also want to tell them to ask the Nigerian government to release our brethren especially those in Maiduguri, Lagos and Abuja and other places across Nigeria. They should be released immediately. Also, for the over two years that we have been with these girls, about forty of them are married, some are dead as a result of airstrike by infidels. We will show you a video of how your own aircraft dropped a bomb that killed some of these girls. Some of the girls have suffered fractures and other forms of injuries as a result of the air strikes. As long as the government does not release our people, we will also never release these girls, that is our message. I specially inform our people in captivity in Lagos that they should be patient and continue with their prayers, God will take us to where no one expects and we will rescue them. All those in Lagos, Maiduguri and other southern parts of the country. Keep praying, very soon, we will rescue you. Where were you picked from? For how long have you been here? What message do you have for your parents and the Federal Government of Nigeria? All I can say is that our (Begins speaking in native language) parents should be patient, beg the government to release their people, so that we can also be released. ( Switched to native language). Most of the girls standing and sitting behind Miss Yakubu were seen fighting tears and using their hijab to hide their emotions. Let me conclude this message by saying that many people have been coming to us lying that they were sent by the Nigerian government to get the girls released. Let the government and the whole world know that we have not sent anyone to negotiate with the government on our behalf over these girls. We have dealt with you in the past before and you know our recommended negotiators. If you need to, you should talk to them. We don’t use our own people to negotiate with you, we use your own people such as journalists to talk with you. We have not sent any other persons. You know that we prefer to use journalist known to you. President Buhari your Army has been lying to you that they have finished us, let them try and see if they can rescue these girls alive.